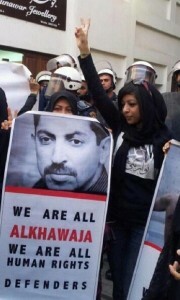 Unable to keep her silent, the Bahraini regime has detained Zainab Al-Khawaja for the past ten days. Will it get away with it? Now that the Formula 1 circus has left its shores, Bahrain has swiftly receded back into the mainstream media’s tenebrous hinterlands. This is despite little having changed over the past week or so, quite the opposite. On 21 April Zainab Al-Khawaja was arrested for taking part in a peaceful protest against the continuing detention of her father, prominent Bahraini activist Abdulhadi Alkhawaja. Once at the police station, female officers turned off the security cameras and proceeded to deliver a beating, kicking and shoving her against the walls, suffocating her with batons while watching male officers insulted her. She was denied visits for more than a week, her family finally getting access last Sunday, 29 April. Over the past two days (Wednesday 1st and Thursday 2nd May), Zainab was sent before the courts, where she discovered the state had not one but four charges ready for her: that she verbally insulted an officer, that she assaulted another at an “illegal gathering”, that she “obstructed traffic” and, finally, that she verbally assaulted yet another officer. She was declared not guilty of the first offence but had all her other cases postponed to next week. These is not the first time she’s dragged before the courts. Indeed, she is still facing earlier charges – of “assaulting an officer”, “illegal gathering” and “inciting hatred against the regime” – dating from Dec 2011, after taking part in another protest. A few days ago, faced with the serious prospect of Zainab’s father, Abdulhadi finally succumbing to his hunger strike (which had lasted more than 80 days so far), the Bahraini regime removed him from his hospital bed and kept him incommunicado for a week; rejecting all requests from his family and lawyers to see or talk to him. When he was eventually allowed to communicate with them three days ago, he revealed that he had been forcibly-fed (a treatment that falls under the Geneva convention’s definition of torture). The bahraini regime must release Zainab Al-Khawaja and drop all its absurd charges against her, as well as release all political prisoners in its jails. If you want to help achieve this, please visit the Bahrain Human Rights Centre website. And spread the word about what is happening in the country. The Al-Khawajas’ courage is a testament to human dignity in the face of oppression, the least we can do is tell the world about it. Powerfully inspiring interview of one of Bahrain’s most courageous human rights activists. oh please. al-khawaja is a fraud. she’s not even bahraini – she’s a danish citizen. just because she happens to be western-trained, fluent in english, well-dressed, and obviously extremely well-funded, she is all over the western press. but has anyone thought that this might not really represent or be representative of the average bahraini woman? how do people born of the elite come to represent “the people” when people like al-khawaja have nothing in common with the common person? why does she continue her drama? is the possibility of political reform in bahrain incompatible with friendly relations with other countries? if so, then why does she keep asking for punishment? what are her views on when reform is sufficient so as to move from a punitive policy to an encouragement policy? and when did political opportunists like her become styled by the media as “human rights” activists? look at her carefully – i stay in the same neighborhood where she likes to hold rallies – and this lady’s statements, presence and media-profile raise far more questions than her sudden appearance on the world stage answer. of course, the comment before this has to be from richard sollom – he is an al-khawaja devotee, just google the two names together. people like this corrupt the label “human rights activist”. Leaving aside the fact she’s originally from Bahrain. Surely it’s for her to decide who she is? Surely this is a much better description, and criticism, of the Bahraini rulers? I’m glad you noticed he posted a comment under his own name. Fair enough. Her Danish nationality should not negate her Bahraini identity. But then why do the BCHR and Al-Khawaja deny expat residents our Bahraini identity? Why do they incite attacks against us? I am afraid to go anywhere close to these rallies that these characters manufacture or the road-blocks they erect. How do I explain this fear to my children when I cannot take them to the mall or their art class? If Al-Khawaja is Danish-Bahraini, then I too am Bangladeshi-Bahraini, Indian-Bahraini, Pakistani-Bahraini, Jordanian-Bahraini, British-Bahraini, American-Bahraini. But her followers call us “foreign mercenaries” who should “get out” because expat men are “sunni-salafi” “killers” and expat women are “prostitutes”. Many of us have settled here for decades, contribute to society and stay out of trouble. Yet, we are not counted as part of the “people” that these so-called human rights claim to represent. Instead, it is a reality of life since last year that expats are brutally beaten by street thugs (the “peaceful, pro-democracy citizens”) who are goaded on by their political and activist leaders. Before 2011, Al-Khawaja was an unknown character and Nabeel Rajab a mouthpiece for the extremist Haq movement. Now they are international stars. That’s fine. But let’s not pretend that their primary concern is any real commitment to universal human rights or the plight and circumstances of all Bahraini people (expat or national). Why should it be? Their primary goal is political, to embarrass the government. As I said, dig into before 2011 and we’ll see an entirely different picture of who these people really are. Those who live abroad are lucky to be able to comment under their own names. They are lucky not to worry about the safety of a daughter taunted at school because her nationality happens to be different from the place she likes to call home.